Tiger of Kai! Just Who the hell do you think I am? This is for you, the late night/early birds/ future warriors! Welcome to your second taste of TAY:Open Forum otherwise know as the Graveyard shift [Enjoying our all cap titles?]. With the main purpose of letting all console warriors [and PC master race ] have a go at discussing what their hearts desire. Let get started! If there is one genre of games that can consume me whole, it is strategy. From simple collection and allocation of resources, to grand campaigns and battles with the treacherous A.I, and crushing defeats. January 1545, the province of Kai, and Shinano. 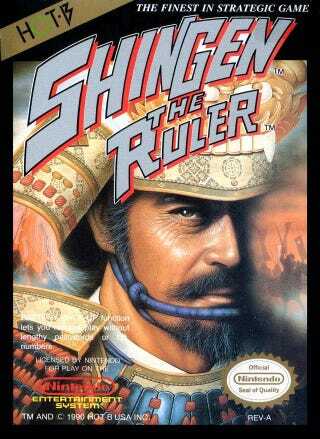 Other wise known as Shingen 2 in Japan, released in 1989 for the NES, and shipped for release one year later by HOT・B USA for (guess where?) North America. Were you, take the role of warlord Takeda Shingen in his ultimate goal to defeat the other Daimyos to unify, and rule Japan. I first played it when I was ten, ten years after its release, and I didn't know a word of English. So while the N64, and PSone was financially out of reach, I was fortunate to own a NES. So that being the case, I dove into the game without knowing what to expect. So guess how confused I was. Now, I could tell you of an epic deep detailed after action report by what my young self could say about the finest point of strategy [give me a break! its been years since I played it ( ._. )], but what I want to hear is your first epic encounter with stagey gaming. *The Graveyard shift is not responsible for your late night procrastination, job loss, and failing grades. Don't forget to head over to TAY for the the Open Forum. Also check it out, we have a contact page! contayct-list Just Read TuT post and you'll be fine.